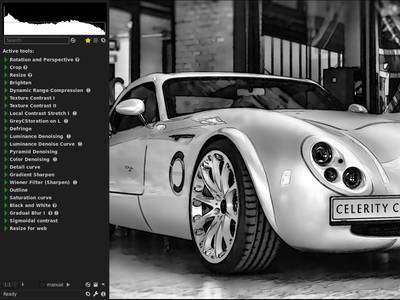 Photivo is a free and open source (GPL3) photo processor. It handles your RAW files as well as your bitmap files (TIFF, JPEG, BMP, PNG and many more) in a non-destructive 16 bit processing pipe with gimp workflow integration and batch mode. Photivo tries to provide the best algorithms available; even if this implies some redundancy. So, to my knowledge, it offers the most flexible and powerful denoise, sharpen and local contrast (fake HDR) algorithms in the open source world. (If not, let's port them ) Although, to get the desired results, there may be a quite steep learning curve . Photivo is just a developer, no manager and no “Gimp”. It is intended to be used in a workflow together with digiKam/F-Spot/Shotwell and Gimp. It needs a quite strong computer and is not aimed at beginners. Want to help improving Photivo? We have a list of easy programming tasks that are great as a starting point. If you're not into coding you could help to get a translation. If you feel confident enough with Photivo, you could also help improving the documentation.